This high end 3.5” lift system is an excellent choice for Silverado and Sierra owners looking to improve their vehicles offroad suspension performance and run 33” tall tires. The system will handle severe offroad use yet provides a supple highway ride for daily drivers. It’s the best of both worlds. 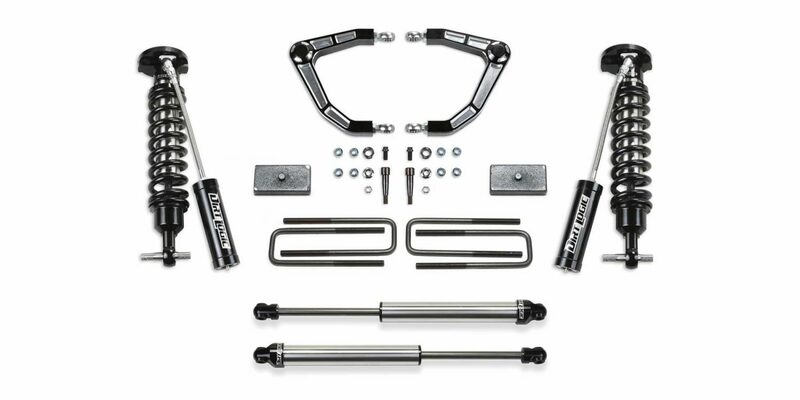 This system utilizes high quality 6061 aluminum Upper Control Arms with stunning machine work and superior strength. They utilize large PTFE lined 1” ID Stainless Steel Uniball bearings and 17-4 Stainless Steel pins that are designed for punishing offroad driving. The Billet Arms are offered with two styles of adjustable pivot ends that attach to the frame for different driving requirements. The heart of this 3.5” system is the legendary stainless steel Dirt Logic 2.5 Coilover shocks. These Coilovers are built of the highest quality materials and will surpass all shocks in corrosion resistance due to the stainless steel body and NitroSteel piston rod. They will provide an outstanding ride quality both on and offroad.